At Water Works Unlimited Inc., we know that landscaping and irrigation can be confusing to those who aren’t in the industry themselves. That said, we’ve compiled a list of frequently asked questions we’ve received over the past few years. If you’ve got a question regarding our irrigation services, be sure to contact us by filling out our contact form or by giving us a call at (919) 570-7808. Why choose Water Works Unlimited Inc.? The experts at Water Works Unlimited Inc. have decades of experience when it comes to irrigation installation and replacement, annual landscaping maintenance, reconditioning services, system evaluation, and more. Over the years, we have helped hundreds of business owners and homeowners maintain and update their landscaping technology, install new equipment, prepare for winter months with extensive and proven winterization services, provide fully-custom landscape lighting designs, and more. If you’d like to enrich the overall look and feel of your property, give us a call! Whether you’re interested in residential irrigation or commercial irrigation, we can help! What is included in your spring start-up service? As far as our spring start-up services are concerned, it is important to understand that every situation is different. For example, if you’ve had winterization services performed, we would need to take additional steps to re-initiate your irrigation system. Generally speaking, pressurizing your irrigation system is absolutely one of the most important things to do when kicking off a spring start-up. What is backflow prevention testing? Backflow prevention testing is imperative when it comes to successfully and correctly setting up irrigation systems. Backflow devices are known as RPZ valves (Reduced Pressure Zone). We install these devices on customers’ plumbing systems in order to ensure water does not back up into any drinking water supply. In most cases, RPZ valves need to be thoroughly inspected each year. They will likely need to be replaced every few years, too. It takes us anywhere from 15 to 45 minutes to inspection a systems backflow and we can typically pinpoint problem areas during that timeframe. Replacing backflow systems can cost anywhere from $300-$500, depending on several factors. If you’ve got questions regarding your system’s backflow and would to inquire about a residential or commercial inspection, contact the experts today! How do you check my irrigation meter to confirm there is static water pressure? In order to properly check your irrigation system’s meter to confirm there is static water pressure, we check the static water pressure in the mainline. How do I confirm there are no leaks in the main valve of my system? We confirm a system has zero pesky leaks by turning on the main ball valve or by inspecting the turn on/shut off valve. Keep in mind, each system is different and there may be additional steps needed to confirm a leak-free system. How do I check the irrigation meter and make sure there is static water pressure? We confirm a system has static water pressure by analyzing the water pressure in the mainline. Do you provide sprinkler backflow preventer repair? How do you program the controller? There is a straightforward reference guide that allows us to program the controller. When doing this, it’s important to ensure the time and date settings are accurate. Keep in mind, each zone should be programmed individually, as each station has different water requirements. For example, shaded areas will require much less water compared to zones that are exposed to sunlight regularly. Which types of sprinklers do you use? We use spray sprinklers and rotors (otherwise known as gear drives). Rotors are designed for larger areas and typically cover between 18 and 30 feet. On the other hand, spray heads are designed for smaller areas and typically reach from 8 to 15 feet. As far as runtimes is concerned, spray heads run from 5 to 15 minutes, while rotor sprinklers run from 18 to 30 minutes. Can you fix broken sprinkler heads? If a sprinkler head does not pop up, or if it isn’t rotating, it’s likely either clogged or has damaged gears. If you’re wondering if your sprinkler heads are repairable or not, contact the experts today, as we would love to provide a complimentary inspection and determine the best route for you. Choosing the correct sprinkler system parts can be tough, and we would love to point you in the right direction. Can I get Wi-Fi capability with my controller? Yes, you can if you download the app and set it up. The app is called the “Rain Bird” app. Reach out to us if you’d like to learn more. We would love to explain and assist with setup if needed. 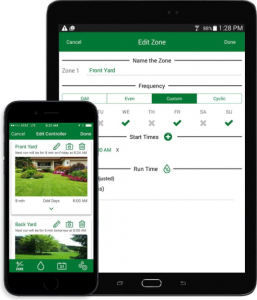 Many of our customers have really enjoyed using the app’s convenient features such as real-time alerts and advanced water management tools. Whether you’re nearby or thousands of miles away, this app is a game-changer. Be ready for controls at your fingertips! The experts at Water Works Unlimited Inc. know how complicated landscaping and irrigation can be. We pride ourselves in providing top-notch consultations to provide the best-fitting solution for your home or business’ needs. Be sure to check out our services page and contact us today to receive residential and commercial irrigation, landscaping, and lighting quotes free of charge by calling (919) 570-7808 or by filling out our contact form.